The testimony of former African National Congress (ANC) MP Vytjie Mentor has come under scrutiny after investigations by the commission of inquiry into state capture brought some of her evidence into question. 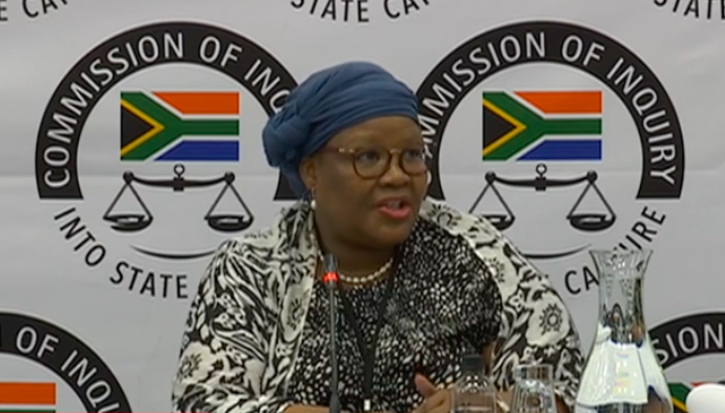 Mentor appeared before the commission for the second time on Monday to conclude her testimony, as she prepares to be cross-examined by lawyers representing former president Jacob Zuma's son Duduzane. Evidence leader, Advocate Mahlape Sello, revealed evidence from the Department of International Relations and Home Affairs proved that Atul Gupta did not travel to China in 2010 as claimed by Mentor. She told the commission in August 2018, that she was told Gupta would be at a state visit by a South African delegation. Mentor told the commission that Atul had several passports and the commission should try and obtain the footage of the first date of the state visit to China to prove whether her submission is false or correct. Sello also revealed that businessman Fana Hlongwane, who has been implicated by other witnesses and said to have close links with Duduzane and the Guptas, was not in the Emirates flight to China as Mentor had testified. She conceded that she was mistaken about Hlongwane and had rendered an apology to him after searching internet images of him and realizing he was not the man she claimed Duduzane introduced her to on that flight. More evidence obtained by the commission put into question the main parts of her submission. She told the commission last year that President Jacob Zuma's former personal assistant Lakela Kaunda arranged a meeting between Mentor and Zuma after the state visit in October 2010. Mentor said she arrived in Johannesburg from Cape Town on a South African Airways flight and was picked up from the airport by Rajesh and Atul Gupta and ended up at their Sahara Computers office in Midrand and later their Saxonwold compound, where she was offered the position of Public Enterprises Minister by Ajay Gupta, in the presence of Zuma. Sello pulled out documents from the South African Airways and Parliament, which did not have any record of Mentor flying to from Cape Town to Johannesburg on the 15th of October. "I must say, I don't have joy with the SAA records, as I say there is a disjuncture between their own records of my flights as I flew SAA, they are records and that of Parliament don't speak to each other, so I stand on what I said, chairperson," said Mentor. Parliament's records show that Mentor traveled to Johannesburg on the 15th of October 2010, which was a Friday, but Mentor claims that she traveled on a Monday. Sello further submitted a report by experts, who inspected the Gupta home, with Mentor and the legal representatives of the Guptas, where three different videos were recorded. "The conclusion drawn by the expert's chair is that none of the features they were asked to identify on in the brief were located at number five Saxonwold. There are other issues that arose during the course of inspection that didn't flow from the testimony of Miss Mentor in August and were not part of the brief provided, there were issues she raised during the inspection," she said. Mentor testified that when she entered the Gupta premises in 2010, there 4 to 5 houses inside, but during inspection only one house was found, she told the commission she was confused by a wall dividing the houses at Saxonwold. She suggested that there may have been some construction between 2010 and 2018 when the inspection was done. Sello said the experts have suggested that a forensic investigation to uncover whether the features Mentor testified to existed in 2010 can be conducted, however, it will cost the commission R800 000. On Tuesday, the commission will deal with some of the footage of the day of the inspection, and expert will testify to the report submitted by Sello.